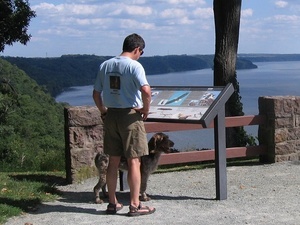 Susquehanna Greenway Signage and Interpretation is the theme of a new mini-grant program offered by the Susquehanna Greenway Partnership (SGP). The mini-grant program was financed in part by a grant from the Community Conservation Partnerships Program, The Keystone Fund under the administration of the Pennsylvania Department of Conservation and Natural Resources, Bureau of Recreation and Conservation (DCNR). The purpose of the mini-grant program is to advance public and private efforts to connect people with the natural and cultural resources of the Susquehanna and promote a sustainable and healthy environment. Award of the mini-grants is focused on interpretative planning and signage projects that will help to improve the experience of people who are using walking, biking, and water trails, community parks, or visiting river towns within the Susquehanna Greenway. Over $50,000 was awarded for: 1.) Developing plans to interpret and promote a community’s heritage, natural and recreational resources; and, 2.) Designing, fabricating and installing signs based on the Susquehanna Greenway Sign Design Guidelines. A total of ten grants are being awarded ranging from $1,200 to $10,000. The project partners are leveraging the $50,000 in awards with an additional $71,000 in cash and in-kind contributions. Clearfield-Grampian Trail Signage: $4,150 for three trailhead orientation panels and trail blazes to help trail users see what opportunities exist along the trail between Clearfield and Grampian. Columbia/Montour County Covered Bridge Signage Project: $2,500 to complete an economic impact study that will validate plans to fund, implement and maintain a comprehensive interpretive and wayfinding signage program for the covered bridges in Columbia and Montour Counties. Duncannon Sesquicentennial Historic Interpretive Signs & Walking/Biking Trail Plan: $10,000 to create and install 8 to 12 historically oriented interpretive panels throughout the community that will be connected by a pedestrian/bike trail plan. 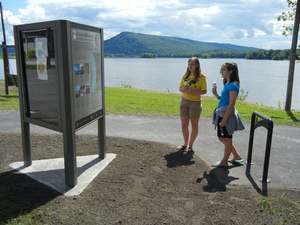 Lock Haven Kiosk: $5,000 to place an information and orientation kiosk at a downtown location to orient visitors to recreation and heritage based assets in the community and provide an overview of the Susquehanna Watershed. Millersburg Ferry Boat Interpretative Sign Upgrade: $4,000 to replace the current ferry boat sign that will orient visitors to information regarding the ferry and its important history. Muncy Borough Interpretive Signage: $5,000 to identify up to 25 locations for interpretive signage throughout the historic district and install interpretive panels. North Branch Canal Trail Signage: $5,000 to install trailhead kiosks, mile markers, and hazard signs along the North Branch Canal Trail that will inform trail users about the historic canal and Greenway. Shickshinny Greenway Orientation Panel at Creary Park: $1,200 to coordinate the fabrication and installation of a Susquehanna Greenway Orientation Panel at the Creary Park Boat Launch area. Sunbury Riverfront Signage: $3,500 to implement QR code based signage program for Riverfront Park focused on nature and local heritage as it relates to the river. Watsontown Canal Boat Pavilion and Canal Path Signage: $2,341 to develop and install interpretive signage that provides an overview of canal history and promote the 1 mile path along the Watsontown riverfront.